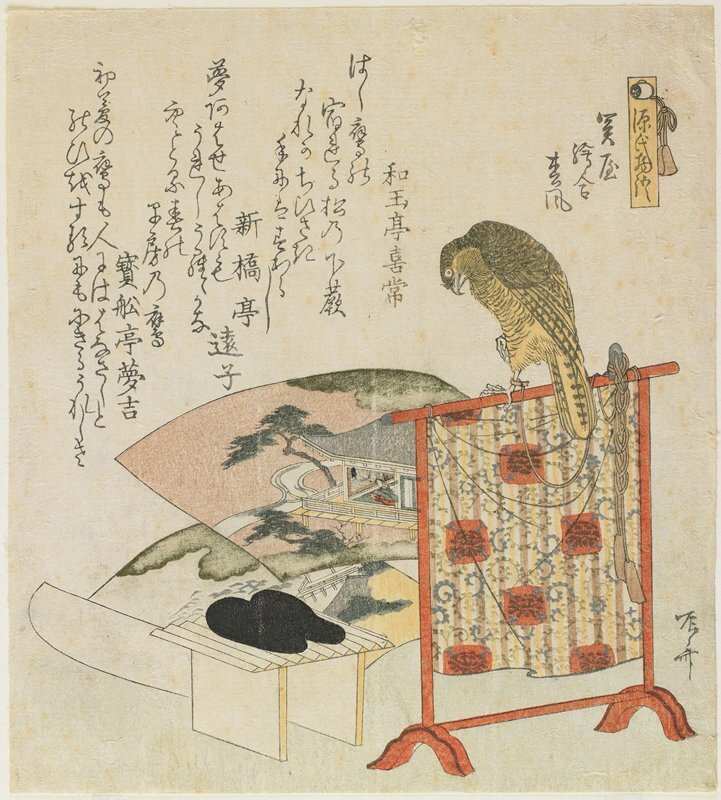 As in the other print by Ryūryūkyo Shinsai displayed here, the objects depicted and poems inscribed refer to three successive chapters of the original Tale of Genji, in this case, chapters 16, 17, and 18. In “At the Pass,” Genji’s entourage has a chance encounter with one of his former lovers and her current husband. Chapter 17, “The Picture Contest,” details a painting competition among imperial consorts with Genji assisting his ward, the future Empress Akikonomu. And in chapter 18, a daughter is born to Genji and one of his lovers, the Akashi Lady. Because of the Akashi Lady’s relatively low status, Genji decides that their daughter will be raised instead by Genji’s favorite lady, Murasaki. The Chapters "At the Pass," "The Picture Contest," and "Wind in the Pines"